St Luke's Blog: Mills & Boon, Love & Tea! I know it's only 11.52am in the morning but it's never too early for romance! I read a review in the London Paper of a rather splendid book club that's been started up at a new tearoom in Soho called 'Yumchaa'. 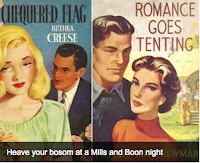 Romance book lovers are encouraged to bring along their favourite Mills & Boon title for discussion over 'proper tea' - no bags strictly loose-leaf! There will be a guest speaker each month and a surprise too! I think it's a really sweet idea and for sure I'm going to pop along to the next one. I'm hoping that the 'no-teabags' policy is the only restriction and that copious amounts of biscuits are allowed! Ok, so we've managed to miss the second M&B bookclub but next one, I believe, is 3rd Nov.